Ripley’s Aquarium of Canada Now Open! | FISHING FURY - A Fishing Blog with Attitude! Ripley’s Aquarium of Canada Now Open! Yesterday was a big day for the city of Toronto. A new 12,500 square-metre (135,000 square-foot) aquarium with more than 5.7 million litres (1.5 million gallons) of water was finally opened. Located in the shadow of the CN Tower, the aquarium promises to be a huge tourist attraction. 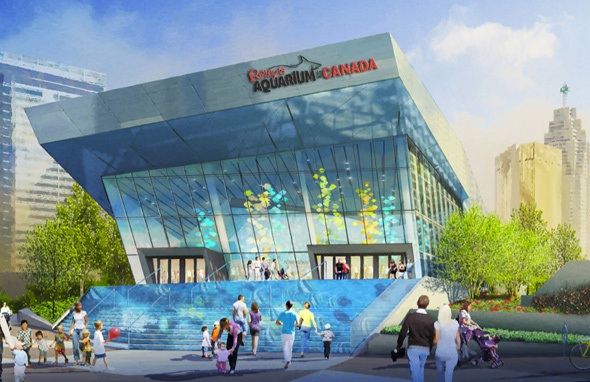 The Aquarium of Canada was originally supposed to open more than a month ago, but was delayed until yesterday. Tickets for the attraction are not cheap ($30 per adult), but a 365 day pass can be purchased for only $100. View the Aquarium of Canada website for more details. Take the little man yet? I was going to go last weekend but didn’t get around to it. Haven’t been yet, waiting for the rush to end! This just in! Rob Ford filmed attempting to smoke the aquarium in a crack pipe.